Sit down Innova quilting machine is great for the home quilter who doesn't quite have the space for a traditional longarm quilting machine. The sit down Innova Longarm Quilting Machine is also great for the quilter who enjoys quilting on a domestic style machine yet yearns for extra throat space to accommodate bulky quilts. The sit down Innova Longarm Quilting Machine is also great for the quilter who enjoys quilting on a domestic style machine yet yearns for extra throat space to accommodate bulky quilts. 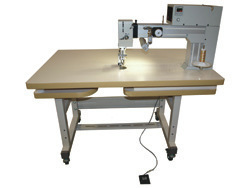 The Sit Down comes with the standard stitch regulator on an 18" INNOVA machine, foot pedal, and industrial style sewing table, Starter Kit and Owner’s Manual. An optional high end beautiful custom wood desk is also available with a 24" drop down leaf and three drawers. The wood desk measures 48” x 65” when the leaf is extended, 30" high.